It’s actually quite odd that the first time there’s an openly gay member of the United States of America’s Olympic Team in the year 2018. It’s been ten years since Massachusettes legalized gay marriage causing several other states to file suit and upheld by our Federal Government. LOGO the first network for LGBTQ+ community has been accessible since 2005 making the LGBTQ+ community visible and celebrated. And let’s be honest, we’ve always suspected that other male figure skaters were gay like Brian Boitano and Johnny Weir. Yet, this is the first year where an Olympic level athlete felt comfortable being open with their sexuality, and that athlete is male figure skater Adam Rippon. Adam Rippon is a member of the figure skating team representing the United States of America at this year’s Winter Olympics in Pyeongchang, South Korea. Not only is he one of the first openly gay members of the Olympic Team in general (Gus Kenworthy, the skier, is the other), he is the only openly gay member to have an Olympic medal. Adam played an integral part in America’s Bronze Medal win in the Team Figure Skating Event earlier this week. “I spoke out because there are people out there whose lives have been affected by change that he’s tried to make,” Rippon said. “I spoke out for them because right now I have a voice, and I think it’s really important for me to use it. This bold statement has caused some people to boycott his Olympic debut, whereas some who were not originally interested in figure skating would tune in to support him. Although Mike Pence tweeted Adam Rippon to show support for #TeamUSA and had his office try to arrange a meeting with the Olympic athlete, Adam also stated that he would not go to the White House for a post-Olympic event and refused to meet with the Vice President. This situation only caused more controversy with an unprovoked tweet from Donald Trump Jr. who claimed that he’s never heard Mike Pence mention Adam Rippon’s name and that he should stop talking about the Vice President. Adam Rippon has not yet responded. But plenty of Twitter users retweeted the Vice President’s tweet directly to Adam and shake their head in disbelief. With a campaign slogan of wanting to Make America Great Again, the best option would be to try to unify the country to support our Olympic Athletes who are representing our country to the rest of the world. But the Trump Administration can’t even get that right. 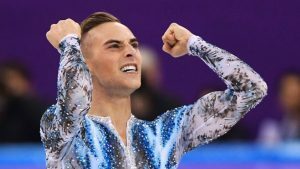 Adam Rippon is scheduled to skate in the Men’s Individual Figure Skating Competition tonight February 15th. You can watch the event on NBC’s primetime Olympic Coverage starting at 7pm.